Don’t let valuable user research insights fall to the wayside. Track, sort, and action feedback to delight your customers with our template. Usability testing sessions are critical in helping teams understand their audience, and build products and design solutions that truly help them. But without a clear and consistent template to store questions, share insights, and assign action items, sessions don’t have the impact they should. Make it easy for everyone to follow. Make your agenda easy for testing subjects to follow and ensure your own team stays on track by creating the agenda beforehand. Ensure consistency. Keep each research session consistent by utilizing the same template each time, so you can get signal on key questions. Action and track insights. After completing your session, make sure you have a place to follow up on action items. By tracking, prioritizing, and sharing insights in Asana, you can assign actionable work and see trends over time so research sessions have maximum impact. Without the right process to track feedback, it falls to the wayside. Find out four ways to make it actionable. What’s the best way to work with a research team? How do you identify the right research method? We can help! This course teaches you the best way to track feedback to prioritize changes and see trends in one place. 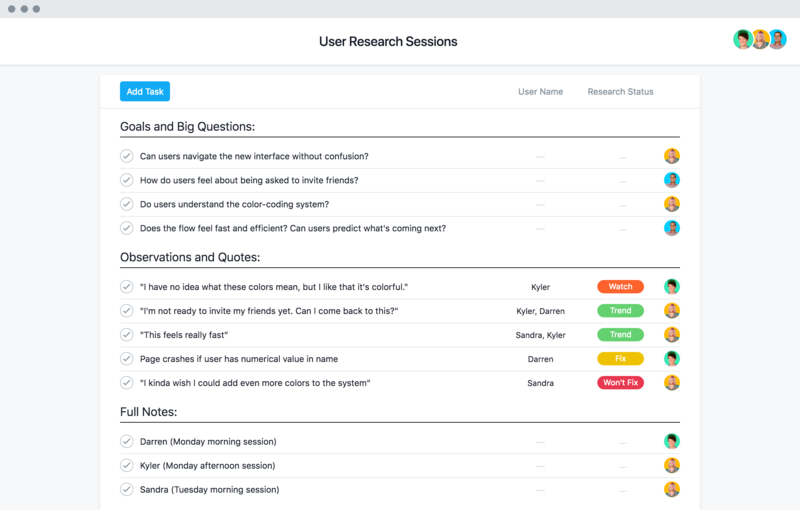 The best user research teams keep their ideas and insights organized with Asana Premium.